Walkaway presents a post-scarcity near future where almost anything--food, clothes, medicine, electronics--can be 3D printed with ease. As capitalism seamlessly transforms to oligarchy and social inequity rages on, many disillusioned citizens decide to simply "walk away" from the rat race to inhabit environmentally ravaged or otherwise disenfranchised territory, free to try their hand at creating whichever brand of utopia they prefer. 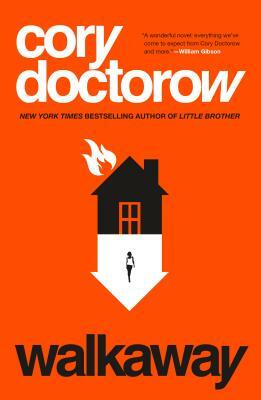 A fascinatingly thorough conception of how spiraling technology will wage war against conventional socioeconomic structures, Doctorow infuses his techno-adventure with lessons all too relevant for humanity as we continue deeper into the 21st century. Fascinating, moving, and darkly humorous, Walkaway is a multi-generation science fiction thriller about the wrenching changes of the next hundred years…and the very human people who will live their consequences. Canadian-born Cory Doctorow is the author of the New York Times bestselling young adult novel Little Brother, and the co-editor of the popular blog BoingBoing. His other YA novels include Pirate Cinema and Homeland (2013), the sequel to Little Brother. His adult novels and short stories have won him three Locus Awards and the John W. Campbell Award for Best New Writer. He has been named one of the Web’s twenty-five “influencers” by Forbes Magazine and a Young Global Leader by the World Economic Forum. He lives in London with his wife and daughter.